Public art is a reflection of how we see the world – the artist’s response to our time and place combined with our own sense of who we are. Public art is not an art “form.” Its size can be huge or small. It can tower fifty feet high or call attention to the paving beneath your feet. Its shape can be abstract or realistic (or both), and it may be cast, carved, built, assembled, or painted. It can be site-specific or stand in contrast to its surroundings. What distinguishes public art is the unique association of how it is made, where it is, and what it means. Public art can express community values, enhance our environment, transform a landscape, heighten our awareness, or question our assumptions. Placed in public sites, this art is there for everyone, a form of collective community expression. Public art is a reflection of how we see the world – the artist’s response to our time and place combined with our own sense of who we are. Who is the “public” for public art? In a diverse society, all art cannot appeal to all people, nor should it be expected to do so. Art attracts attention; that is what it is supposed to do. Is it any wonder, then, that public art causes controversy? Varied popular opinion is inevitable, and it is a healthy sign that the public environment is acknowledged rather than ignored. To some degree, every public art project is an interactive process involving artists, architects, design professionals, community residents, civic leaders, politicians, approval agencies, funding agencies, and construction teams. The challenge of this communal process is to enhance rather than limit the artist’s involvement. 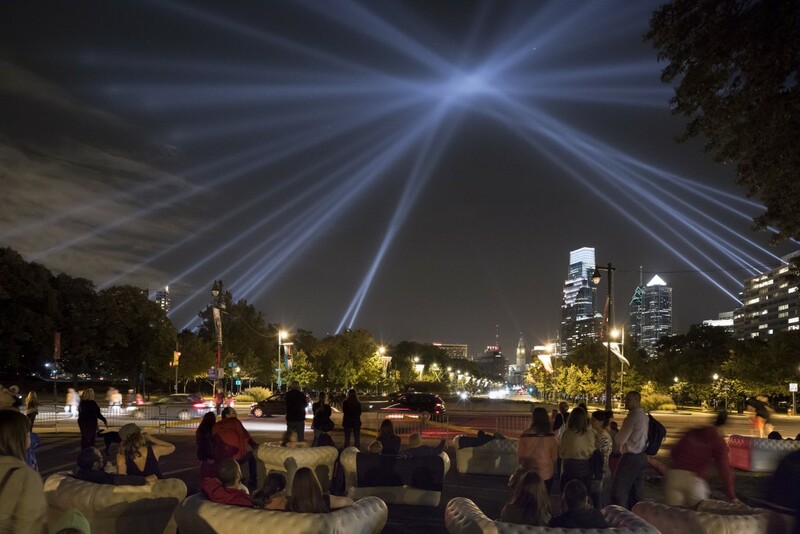 OPEN AIR (2012) by Rafael Lozano-Hemmer. Photo James Ewing Photography © 2012 for the Association for Public Art. What is the “art” of public art? As our society and its modes of expression evolve, so will our definitions of public art. Materials and methods change to reflect our contemporary culture. The process, guided by professional expertise and public involvement, should seek out the most imaginative and productive affinity between artist and community. Likewise, artists must bring to the work their artistic integrity, creativity, and skill. What is needed is a commitment to invention, boldness, and cooperation – not compromise. Public art is a part of our public history, part of our evolving culture and our collective memory. It reflects and reveals our society and adds meaning to our cities. As artists respond to our times, they reflect their inner vision to the outside world, and they create a chronicle of our public experience. Adapted from Public Art in Philadelphia by Penny Balkin Bach (Temple University Press, Philadelphia, 1992).